Great news! Our preliminary application to the Big Lottery People and Places scheme has met with success at the second attempt! We are now waiting for the forms to come through to complete for stage two. This is where we actually have to submit detailed plans and costs for the project. There is still a VERY long way to go but at least we are on the way! At the time of writing Debbie is still waiting to do her Skydive! Plane problems and adverse weather have forced four postponements but we all have our fingers crossed that she will take the plunge on November 13th. So, there is still time to sponsor her, if you haven’t already done so. Phone Debbie on 01646 600679. More than £140 has already been collected! Have you filled yours yet? Please return your full jars to either church, or to Jenny Rayner, (01646 601248) and don’t forget to collect a new one! Back at the beginning of September 35 people came to St Tudwal’s for the day to learn about its history. And what a treat they had, with super talks from Simon Hancock and Phil Bennett, and a great buffet lunch in between. More than half made the trip up to the top of the tower and scrambled under the floor. And £285 was raised for the hall fund too! Thank you, gentlemen, for donating your raffle money to the fund! 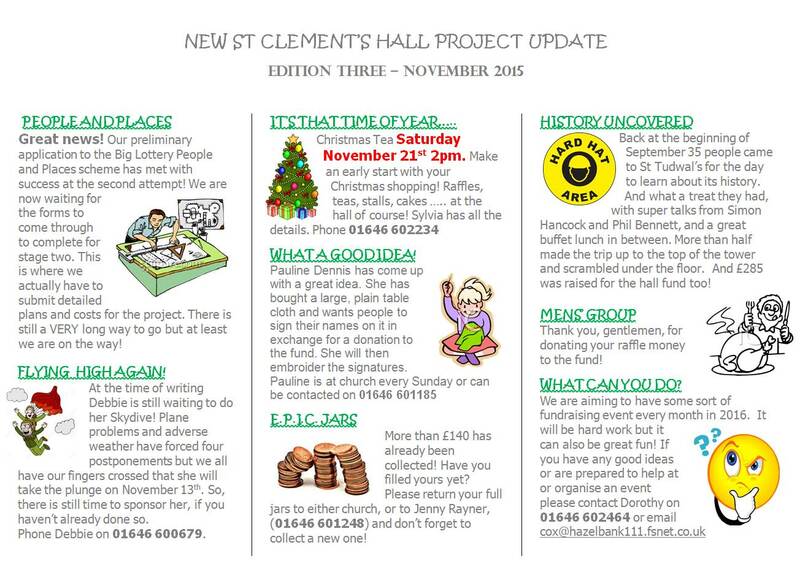 This entry was posted in Community news on November 6, 2015 by admin.